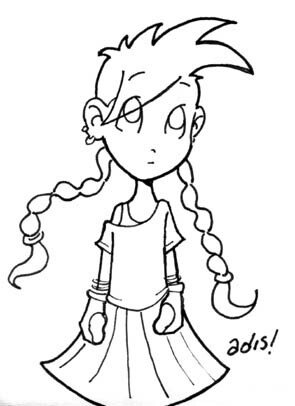 Adis says:This lovely lovely colring work was done by the always kind Ping Teo, author of The Jaded, who is one of the original supporters of CYS, even before it went online for the first time! So, all my gratitude goes to her. Here's today's new drawing, an image of Little Laurie as an 80's pop princess. 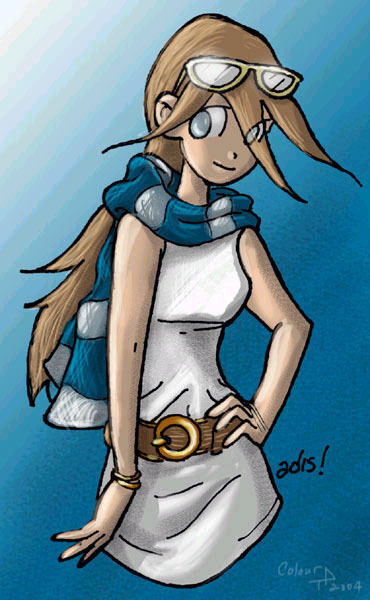 This time, the rule is modified a bit: you can draw her hair blue, or in the dark shade of purple from the "Back In Time" segments. One last announcement: Tomorrow's No Room For Magic is going to be a little late. I'm working on a few cool things I'll let you know about soon, but they take up a lot of time, so I need to postpone it for a day. All of you NRFM followers out there, you're the best and the most understanding of fans, thanks!